CollabNet kicked off the new year with a 3 part series called Go Agile with Git on January 15, 2013. This series is designed as a crash-course on managing Git workflows and continuous branching and merging in Agile software development, then explores the power of code review with Gerrit and Jenkins. 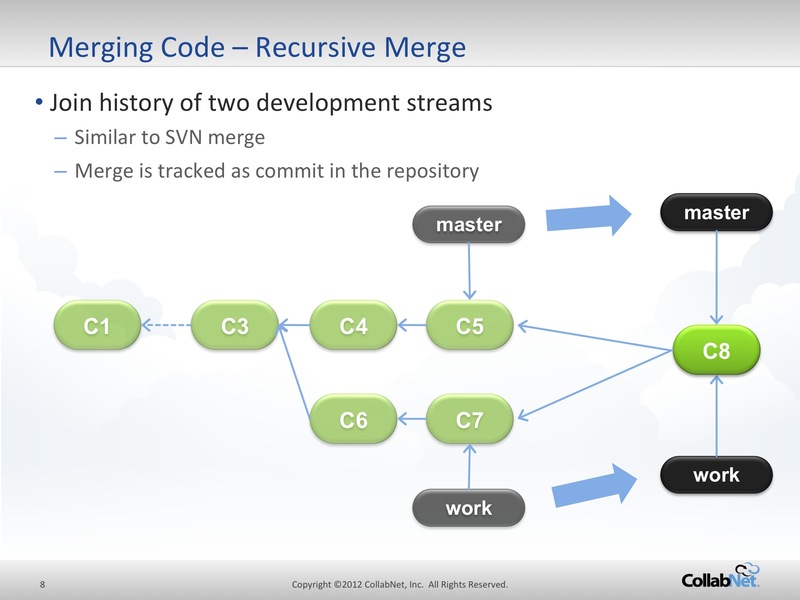 Part one of this series was on Git workflows, branching and merging and had over 200 webinar participants who attended! Thank you to everyone that attended, but if we missed you please register for the on-demand replay. Our guest presenter, Luca Milanesio, is pleased to elaborate on all questions and comments from the webinar. Luca is Director and cofounder of GerritForge LLP, key technology partner of CollabNet, and has over 20 years of experience in development management, software configuration management and software development lifecycle management in large enterprises worldwide. A: Dashboards have been introduced in Gerrit in November 2012 hackathon and are one of the major features of Gerrit 2.6. A: Gerrit allows the usage of RBAC (role-based access control) through its group level permissions. Groups can be defined in LDAP and Gerrit Ver. 2.5 can use them and retrieve them dynamically using the its pluggable “group backend” infrastructure. Groups LDAP entry points need to be configured in gerrit.config in order to be fetched by Gerrit. Similarly other external sources can be plugged as “group backend” into Gerrit by implementing the connector interface to the external roles as Gerrit plugin.